Heraldry originated in the Middle Ages when it became necessary to identify men who were wearing armour which completely enveloped their person, as well as to have some individual or personal mark for members of the upper class of feudal society. Selected towns or burgh's were granted a Royal Charter and this also warranted their own individual Coat of Arms. In heraldry the various terms used have specialised meanings, there are two light colours, white (argent) and yellow (or) and are called metals from their similarity to silver and gold which are also used. The four dark colours, red (gules) blue (azure) green (vert) and black (sable) these are called colours. Each of these metals and colours may be represented by textures, for example black spots on a white background is a texture called ermine, but as a rule the colours must be on or against metal so that the contrast is sharp, definite and legible. The shape of the shield on which the arms are represented can vary considerably except the shape named lozenge which is reserved for a womans' arms. The original charter of Royal Burgh was granted to the town in 1373 during the reign of Robert III, but this was suppressed by William, Earl of Douglas who held the barony of North Berwick during that period. The Earl refused to implement the charter because he might lose his right of superiority over the port and burgh. The charter now in existence was granted by James VI on 18th September 1568. 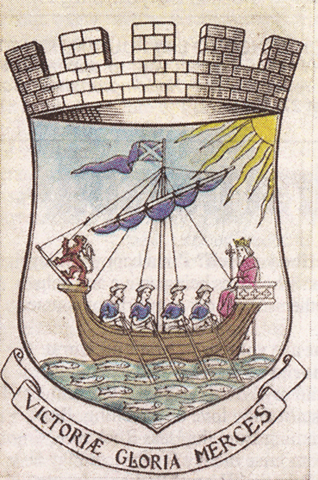 The Marquis of Bute in his work on the Burgh Arms of Scotland thus describes those of North Berwick -" Argent, on the waves of the sea semee of fish naiant to sinister, all proper; a lymphad with sails furled, also proper, flying a pennon of the flag of Scotland, viz., azure a saltire argent; on the prow a lion rampant gules, armed and langued azure; rowed by four mariners habited proper; in the stern a king royally crowned and robed, also proper; the rays of the sun issuant bendwise from the sinister chief, also proper.Ó He adds ' The mariners wear regular Kilmarnock bonnets with tassels. The figure in the stern is very indistinct. It wears an open crown, which argues a period earlier than James IV by whom arches were for the first time added to the crown of Scotland. It is probably a representation of Robert III, by whom the Burgh was erected. Moto of the seal of North Berwick - Sigillvm burgi de North Berwick, Merces victoriae gloria - a reward of victory gained by glory - 1720. The system of armorial and burgh bearings that evolved over Western Europe led to the establishment of centres in each country for the granting and recording of such things and in Scotland the office of Lord Lyon, King of Arms is used for this purpose. Lord Lyon is a Great Officer of the State and a judge with his own court. He is appointed by the sovereign, answers to no one else and is responsible for granting armorial bearing of the recognition of clan chiefs. It is a treasonable offence to assault the Lord-Lyon when he is carrying out the monarch's work. The Lyon sits as judge to oversee any abuse of heraldic law brought to his court by his procurator fiscal. His court comprises of the Lord Lyon and the Officers of Arms in Scotland: the Albany Herald, Rothesay Herald and Ross Herald, the senior officers: and the Unicorn Pursuivant, Carrick Pursuivant and Bute Pursuivant, the junior ones. His is the only court of chivalry in regular use, and is completely integrated within the national legal system. At his discretion, grants for armorial bearings are made. If evidence of inheritance can be proven, the original grant may be 'matriculated' or altered for the grantee's descendants, and it is then recorded in the Public Register of All Arms and Bearings in Scotland by his Clerk and Keeper of the Records. In addition to his services to the cause of heraldry, the Lord Lyon makes Royal Proclamations from the Mercat Cross in Edinburgh. On 8th February 1952, he proclaimed Elizabeth II, Queen of Scotland at Edinburgh Castle. His title itself refers to the use of a heraldic lion on the arms of Scottish kings and may date back to William 'the Lion', who reigned from 1165 to 1214. The lion appeared on his son Alexander's shield, and has been in use ever since. The Royal Burgh of North Berwick coat of arms (above) was withdrawn in 1975 when government legislation disbanded the Town Council in favour of local authority regionalisation. Part of this restructuring was to elect a Community Council to represent the views of the town and whose first priority was to enlist the assistance of Lord Lyon, King of Arms and successfully reinstate the Royal Burgh title and a new Coat of Arms was approved. Copyright © Douglas Seaton 2015, All Rights Reserved.